At the PC Meeting tonight, it was announced that although the developer has their previously denied plans in litigation through the courts, they are appealing the township’s decision to deny the plans, they have submitted NEW PLANS to be reviewed. Stay tuned as all our hard work for the past year dissolves in the hands of our local governmental officials, because they could not, or would not, make changes to our outdated ordinances to provide the community and their residents better safety and health safeguards. This is an exciting meeting as we were certain that the Board of Supervisors would be making their decision. We had spent the past 30 days on this extension hiring additional engineers to review our documents, pushing our attorney’s to review the engineering findings and developing a plan should the BoS say “yes”. Lo and behold … our township stood firm. They used the information we had been providing and brought in our outside engineering firm to beat the heck out of the developer with problem after problem with the plans as they are. Read the notes from the meeting here. Bad news? The developer has 30 days to review the new evidence and come back with how they can revise the plans to accommodate the ordinances. Some reporting was done at the meeting. This meeting went on for so long that my recorder ran out of recording time. It’s a shame because I missed out on the battle between Dan and Kate over who had the biggest balls. Long and short of it, our uneducated and misinformed Planning Commission members accepted the opinion of Keystone Consulting (who shall forever be known as the Keystone Yahoos) that the plan was acceptable at the PC meeting on September 18 and passed it to the Board of Supervisors with an “OK to approve”. This was when we knew we had to get legal assistance because the plans are a mess and no-way should they be approved at ANY level. We are still trying to determine who should be held culpable. Our Board of Supervisors, taking the time at the meeting to listen to me speak, listen to the developers speak, hearing resident comments, allowing Dan Becker to give legal advice … decided that there were four areas of concern that needed to be addressed before they could approve the warehouse preliminary plans. (1) Another traffic safety study for the Rhoades Rd, Rt 737, and Old 22 Five Point intersection. (4) Engineers need to re-review the setback for the retaining wall and fencing proposed. I do not imagine that they will have the fortitude to just say “NO” based on the information, documentation and research that we have provided to them. Three different attorneys state that they have enough legal ammunition to say “NO” and go before a judge on a lawsuit from the developer and win. We have irrefutable proof and documentation, as well as the expert advice of an outside engineering firm, that No ifs, ands, or buts, two fire apparatus access roads are required. The unequivocal reason for this is IFC 2015 D104.1 as presented on the attached drawing. D104.1 is a mandate and excludes approval from the Fire Chief or Fire Code Official. Next, Section 408.2.A specifies that the Minimum side yard is 25 feet. From the preceding definitions, a retaining wall cannot be located within the building setback. It was already established that a retaining wall is a structure, specifically, an accessory structure. These two items were part of the twelve items presented at the Planning Commission meeting in which we were told “it is too late to present any more issues” and they (the Planning Commission and the Engineering Firm) refused to review those twelve items prior to making a decision to the Board of Supervisors. We took Dan Becker’s advice and hired two different attorney firms to help us get the township to review our concerns. Thank you to all the people that signed the letter we sent to our state and county representatives. Thank you to all the people who are helping to fund the costs of these attorneys. We have a time line based on documents we have been receiving from our RTK requests. I am saddened by the fact that I have never been involved in our local governmental meetings. If I had, maybe we could have gotten involved sooner and stopped this warehouse. I have a time line for everyone to review. It took me six months to get all the proof and documents together. The Planning Commission rejected all our research, documentation and local examples of devaluation of resident safety, resident health, and resident wealth stating they are all excellent but can only be considered supposition. There is no proof that any of these things will happen here in Krumsville after the warehouse is built and occupied. They voted to approve the preliminary plans for the Board of Supervisors to review. Our attorney states that we have given the necessary documentation to the BoS for them to morally, as well as legally, deny the warehouse building permit. We must all push them for that denial at the October 2, 2017 meeting. I had reached out to our many Greenwich Township residents to attend this meeting to show support and we had 102 people in attendance at this meeting. We also had The Reading Eagle and The Morning Call reporters in attendance. There were many items discussed at the meeting, I have recapped it here on this linked page. Well now, this was a very scary Planning Commission meeting. Keystone Consulting Engineers were prepared to sign off on the plans with their newly submitted Engineering Review, pending the outside agency permits being obtained. Their representative, Chris Noll, stated there were no outstanding technical issues on the plan. On behalf of Krumsville Community, I stood and brought up some outstanding items and they had not been reviewed by the PC members nor by K.C.E. THANK GOODNESS, our township Solicitor, Daniel Becker advised the PC Members to not go any further in the review until all the documents we (Krumsville Community) had submitted were thoroughly researched and until his offices had an opportunity to review the two items that the developer wanted waived. We were unable to attend this meeting as we were out of the state on vacation. Leroy Kerschner did speak on behalf of the community regarding the warehouse project. I do not have any notes from the meeting to give you an update. I have failed the residents as I missed this meeting. Mostly because I was out of town all weekend competing and upon returning on Monday, fell into a deep “I am worn out completely” sleep and failed to rouse myself in time to make the meeting. I have not been able to get any news on what transpired at the meeting. STAY TUNED. The Board of Supervisors meeting will be held at the normal time, 7:30 pm. Not that many in attendance tonight, only 19. Granted, tonight is a holiday evening. Okay, lots of fun at this meeting. If you missed it, this blog won’t hardly give you the entertainment value that those of us in attendance received. I am going to attempt to be fair and impartial but WOW … there is a need for some “Emily Post” etiquette training classes!!! WOW!!! Before the meeting even started, there was some discussion between the BoS members and the solicitor, Joan London, in hushed voices regarding the Crossroads X Project. Very unprofessional. Many people were straining to hear. Meeting started and although Dean Bruno was on the agenda (again), he was not in attendance (again). I am very curious what Mr. Bruno wants to discuss with the BoS. Fred German stood up and asked to speak about “Why Greenwich Township is not demanding a certified PE (Professional Engineer) sign off on the Plan Reviews”, all plan reviews but specifically the Crossroads X Warehouse Project Plan Reviews. Per Fred, the NSPE and the Pennsylvania State law, all engineering plan reviews must be signed by a certified engineer. I looked this up this evening, and Fred is correct. The NSPE Board of Ethical Review can hold liable any engineering firm that presents Plan Reviews not signed by a Certified Professional Engineer. The solicitor, Ms. London, attempted to distract Fred by stating this is the practice of many firms, to have engineers of different specialties review the plans and then their Engineering Consultant signs off on the entire plan. This may be the “practice” but the Pennsylvania State Law requires a PE to sign all engineering plan reviews. 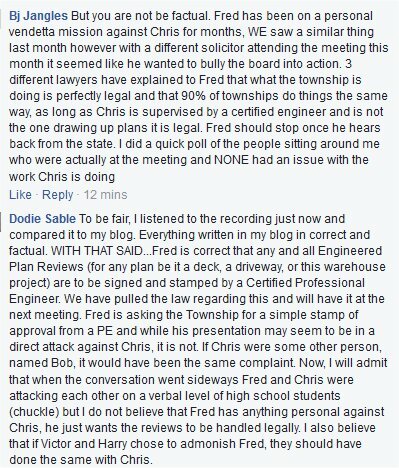 Chris Noll (once again) became agitated at Fred’s continued demands to have all plan reviews signed off by a PE and it became a heated (and very loud) discussion. This set the tone for the rest Fred’s concerns. I attempted to interject my own observations, and comments from two engineers that looked over the Plan Review on our behalf. They both expressed concerns that the Plan Review was not signed off by a PE. However, my raised hand was ignored and the conversation between Chris, Victor and Fred was getting heated so I dropped it. When I came home, looked it up and YES, there is clear evidence that Fred is correct. And, Fred stated that he has filed a complaint with the Board of Engineers. Once he made that statement, Ms. London shut him down stating that until a decision came back from the Board of Engineers, they would continue to do things the way they always have, as it is standard practice at engineering firms, and this discussion was over for tonight. We will be sending off a letter to the state to confirm this information. Then Fred brought up the traffic issues surrounding a storage facility versus a distribution center. Ms. London jumped in, cut him off, and said that the traffic numbers are averaged, and are subjective … OH NO! I stood up and quickly cut off Ms. London, explaining we had already done the research and had documents filed with the township from ITE showing that the numbers that McMahon presented to the Planning Commission was incorrect. She did then agree that if we had ITE numbers, then those should be submitted. Victor quickly jumped in, cutting me off stating that all this was discussions for the Planning Commission, not the the BoS (Yes, yes, we know and we have already filed the necessary paperwork WITH the Planning Commission) HOWEVER! If your solicitor is going to speak about the traffic issues, she should be better educated and up to date with what we have already presented. About that. Crossroads X Warehouse Project … the developer has asked for another extension until Oct 2, 2017 due to not having obtained their permits from outside agencies. This was the hush hush conversation taking place at the table before the meeting started. I know, because I was in the front row and heard it. The BoS granted them another extension with the clause that if Greenwich Twp does not see forward movement in obtaining their outside agency permits, then no further extensions will be granted. Ms. London approved this contigency for approving extension #2, so the BoS voted and granted a second extension. Fred brought up something that many of the township residents have commented on (mostly after the meeting out in the parking lot, but some have even posted it on Facebook) the fact that Chris rolls his eyes when subjects are brought up (over and over) and is consistently making disparaging facial expressions and sarcastic body language … which is easily read by those in the audience … and Chris makes side comments when the residents speak up and ask questions. Fred directly accused Chris of making faces when Mrs. Dietrich brought up her combine story. (We all saw this last month and it is mentioned on Facebook by another resident.) and Fred suggested that Chris has no patience with the township residents and it should be addressed by the BoS. AND IT WENT DOWNHILL FROM THERE. Victor got involved, Harry admonished Fred and told him he was being rude and out of line, Chris had a couple personal comments about Fred’s vendetta against him, and Harry reached out to the Reading Eagle reporter with a direct comment to please publish in the paper that Fred is wrong. OH MY … I have edited this account because (A) it went on for 11 minutes and (B) while entertaining, it really does show a lack of class by everyone involved. AND … Victor took control of the meeting with his gavel and asked if anyone else had any comments. Mrs Dietrich asked the township to write a letter to the land owner of the Crossroads X Warehouse Project and ask them to do a weed kill on the property. Since it is sitting fallow, it is full of Mare’s Tail (weeds) and they are extremely invasive, causing damage to the surrounding farmer’s crops. The BoS agreed to send a letter. I am going to do a follow up on that next month. Growing up as a hay and dairy farmer, I am well aware the damage that Mare’s Tail can do when it starts invading crops. We still do not have a agreeable Ambulance plan in place. The BoS is asking a third party for a review of the two different proposals. We lost Tara as our township secretary so the website issue did not get resolved. Alice had made two calls this past month and claims no-one called her back. Not sure how that works, in most cases when someone calls to do business, the business calls back (I know I do!) I wanted to stand up and offer to help but thought better of it after the earlier yelling match between the BoS and Fred and I kept my mouth shut. Next month, if we don’t have a website plan in place, I will get onery next month. Speaking of that. They hired a new secretary tonight and voted on it. Welcome to Jane Werley! Be nice to her when you call in, she is part-time. At this point in the meeting, Harry made a public apology to Fred for his outburst. Thank you Harry. The Dreibelbis Station Covered Bridge was granted 1.5 million dollars from the National Historical Society to be repaired. It is stated that bidding started this month. The Crystal Cave bridge will go under repair in the spring of 2018, so expect detours. HERE’S AN INTERESTING FACT: The Old 22 swap is still not official. Supposedly the State of Pennsylvania is waiting on budget and financing to make the swap. At this time, Old 22 is still under Greenwich Township jurisdiction. A complaint was filed tonight by Chris that there is a huge bump in the road in front of her home and everytime a dump truck or tractor trailer drives by, it bangs very loudly going over that bump and she’s like it repaired immediately. And yes, there will be a Planning Commission meeting on July 17 at 7:30 for another Greenwich Township resident. Nothing for Crossroads X Warehouse. Some FB posts: I welcome every opinion! Planning Commission meeting was cancelled as there were not any open items for review. At this time, the Crossroads X Warehouse project is still on extension and they have not filed revised plans. There were 57 people in attendance at the meeting (THANK YOU!). First item on the agenda was for the Board to hold an official Hearing. This was to pass the Zoning Ordinance Amendment. (Public Notice on April 10th 2017) Dan Becker, Solicitor reviewed the changes as proposed and the Board passed it unanimously. In short, they have removed the ability to have any kind of warehousing or storage in a commercially zoned district *AND* Warehousing in the industrial zoned districts are subject to Section 503.34 (Special Exception). Mr. Yenser was upset by the ordinance changes as he has a buyer for his 73 acre plot of land in the commercial district and the intention of the buyer was to build warehousing. Dean Bruno was on the agenda to speak and he did not attend the meeting so we do not know what he wanted to bring to the BoS. There was nothing new from the Crossroads X Warehouse Project and their extension is valid through July 31, 2017. The owners of the property were in attendance at the meeting. They had reviewed the three website propsals and have chosen to go with NE Studio to update and keep current the Greenwich Township website. YAY! We should see an updated website very shortly with information posted on a regular basis. Due to the contradictory nature of the Ambulance propsals, the BoS has decided to forward the two submitted proposals to Berks County (Mr. Godshall) for review and advice on how to proceed. DEP has approached the Township about putting into place a 537 plan for sewage control. This matter was discussed intensively with the residents in attendance. Basically, DEP wants a plan put into place (example, could be something as simple as residents have to empty their septic systems once every 3 years or could be something as extensive as annual testing and fining for failing systems.) The Township has been resistant to putting a plan in place as the costs are high, in the 6 figures, to design and implement a 537 plan. The township offered DEP to attend this public meeting and DEP refused. Which brought up the question. Greenwich Residents requested a public meeting with DEP regarding the parcel of land proposed for Crossroads X. Dan Becker states that getting DEP to give us a public meeting is highly unlikely. We (the residents) need to push DEP to give us a public meeting regarding the wildlife that will be affected by the warehouse construction and ultimate pollution from diesel fumes and traffic dust that will be generated once the warehouse is up and running. I will start an investigation into getting their attention. Two State Police officers attended the meeting to reach out to the Residents. One of the concerns that came up was the tractor trailer traffic on Rt 737 and that they do not obey the speed limits and other posted signs. The PSP states they will setup a radar sometime in the near future to monitor traffic. it was suggested to setup by Three Mile House. The BoS retired to chambers to discuss financial matters before the meeting concluded. There will not be a Planning Commission meeting on June 19, 2017 as there are not any new items to be reviewed at this time. Next BoS meeting will be on Monday July 3, 2017. We’re have been added to the agenda for the May 15, 2017 Planning Commission meeting. I have been in contact with these agencies for information and questions to add to this meeting. We will be filing some demands/petitions at this meeting. If you have not visited my home and signed your name to the “speaking for me” paper, please do so. The more names I have on that sheet, the louder our voice is at these meetings. The Board of Supervisors meeting went very well. We presented our second request for answers to our nine questions and we also submitted the requests to have the website updated. The BoS actually did hear us last month as their web was on the agenda under NEW BUSINESS. Yay us! Now, we have several other items to present, but that will have to be at the Planning Commission meeting. Crossroads X will not be on the agenda at the May 15, 2017 meeting, however, I have requested we be added to the agenda. I am instructed that we can bring up anything related to the warehouse as the original plans have been submitted and are now under review. Note to everyone, the contractor has requested a 90 day extension (until July 31, 2017) to review the changes our PC requested due to SALDO and to obtain their permits from DEP, PennDOT and NPDES. This gives up 90 days to do our investigations and place our complaints, disputes and petitions. I have to be blunt. There is a lot of confusion right now and I am doing my best to get the answers to all the questions. Allow me to say this. Our township BoS is doing their job. The parcel of land is zoned industrial and warehousing is a legal use of that property. However, in the past 17 years, since this property was re-zoned, many things have changed in The Lehigh Valley. One of those changes is the I-78 corridor becoming a huge distribution center for the Northeast. Our BoS could not anticipate the amount of changes to warehousing and the volumes of tractor trailer traffic that is generated by warehousing, that occurred over the past 17 years. Automation and computerized counting have quadrupled the speeds in which goods can be delivered, stored, and parceled out for distribution. At the time the BoS chose to make those parcels industrial, warehousing was not the “in” thing in The Valley. Small factories, manufacturing and strip malls were the growth at that time. Our small town of Krumsville is in no way able to handle the kind of traffic that will be generated by a warehouse. We have to step up to the plate, and prove through investigation and due diligence, to our BoS the pitfalls that will occur if a warehouse is built on that parcel of land. Then, they can make a legal judgement to deny a warehouse on that parcel based on the ordinances that we already have in place. With that said, we all need to be involved in the process. Our goal in this dispute is to prove the dangers to our small historic town and to the residents of Krumsville, as well as residents north and south of Exit 40, due to the volume of traffic that will be generated by a warehouse. There will be a point in this dispute where we will have to put up, or shut up, because we will need to retain an attorney who is educated in these types of disputes to help us through. Right now, we are at the infancy stages of the investigation, and it may be enough . If not, we have to be prepared to dig into our pockets to save our town. The PennDOT meeting was very civil and informative. It definitely was NOT what we wanted to hear and many of the residents that attended the meeting, left the meeting feeling defeated. This meeting actually opened up many new avenues to pursue in getting the warehouse project stopped. Stay tuned, I am working up a lot of different complaints now, and we (the Krumsville residents) have been advised to document the damages to our homes caused by the recent traffic and construction of the new I-78 bridge interchange and to have our wells tested right now to give us a baseline for future issues which may arise. The April 3 meeting was very informative and civil. The BoS were supportive of our concerns and complaints. We filed over 100 copies of the three complaints below. now we are compiling additional complaints to file. We are still researching and as we come up with documentation, we will compile additional complaints to be filed with Greenwich Township. I am looking for anyone that personally knows Bruno and his denial for construction of an additional 3 bays to his garage. The Township stated “Increased tractor trailer traffic is the issue.” We need a copy of that denied construction. I am looking for anyone that personally knows William Stoerrle Jr., a certified real estate appraiser with Key Realty in Bethlehem. He conducted three studies in Lower Nazareth proving that construction of a warehouse in a residential community lowered property values 11.5%. I need copies of those three studies. I am looking for anyone that personally knows Breena Holland, an associate professor of political science and the environmental initiative at Lehigh University. She did an air quality study in an area before, during and after the construction of a warehouse. The results are astonishing. I need a copy of that study. It is my personal opinion that based on the responses from PennDOT to our Township BoS, that Greenwich Township has every right to deny the construction of the warehouse because PennDOT openly admits our roads are unsuitable for high volume traffic and PennDOT cannot make any changes to make the roads safer and more suitable due to the structures in place along the roads. We are also developing a list of questions and concerns to bring to the April 12th PennDOT/Greenwich Township/Developer McMahon meeting which will be held at the Township Building at 1:00 pm. Please review the meeting Blog and add any relevant questions or concerns you have. We will address each one, I promise! Below are links to the complaints we need to be filing at the Board Of Supervisor meeting on Monday April 3, 2017. Please feel free to print this form, share it with your neighbors, fill in your name and address, sign it and if you cannot attend the meeting, simply bring these forms to my house and I will submit it on your behalf. Choose which ones you believe are appropriate to you. complaint3_form – Warehouse construction violation of Ordinances 801 and 802. After attending the March 20, 2017 Planning Commission Meeting, we have started digging and we are finding many Greenwich Ordinance violations regarding the proposed warehouse project. While we realize the plans have only just been submitted, the entire project itself is a violation and the tractor trailer traffic that it will generate violates eight different ordinances. We will be posting these violations as we confirm them on this VIOLATIONS page, and on the Krumsville Warehouse Facebook Page. And to further add fuel to this fire, in 2009 Greenwich Township published a plan to Build For The Future. This Plan very clearly states they want to limit tractor trailer traffic within the township. Very shortly after this Joint Comprehensive Plan was put into effect, a local business was denied a construction permit to add three bays to the garage as it would generate too much tractor trailer traffic. As soon as I get permission from this business to post the name and details, I will put it on here. was there a 30 discovery posted anywhere? we went through this in Longswamp TWSP. you need to present any and ALL ecological issues, noise ordnances, light ordnances, impact on the roads, impact on air pollution, traffic study done? DEP been notified? ground contamination from runoff from the warehouse, sewer issues, where is the water getting pumped to? property values will drop like a stone!! also need to voice farmland preservation. join the Longswamp page, lots of good info on there to combat and slow down the process.